Talking about cities is a nice topic for an elementary discussion class. All students can relate to this topic so it’s relatively easy to brainstorm vocabulary and opinions. 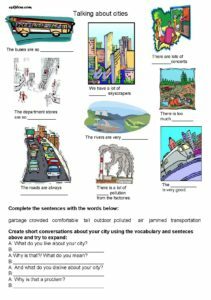 City related images in the ESL worksheets play an important role in engaging the students. Students match the vocabulary to the appropriate pictures.Then they ask each other questions about cities using the questions at the bottom of the page. Click on the image below or the link to download the PDF file. 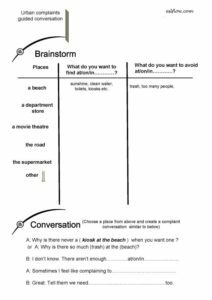 An elementary brainstorming and speaking activity to help students discuss cities and urban areas. 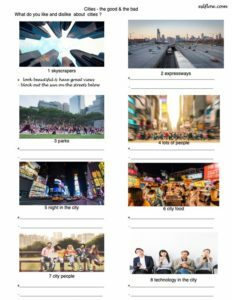 This is a discussion worksheet for giving opinions about cities. 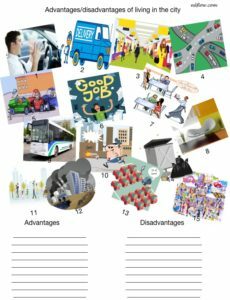 Students need to think about positives and negatives of aspects of city living. Students think of city related topics they’d like to speak about and fill in the topics in the lefthand column. Then then write their own opinions about each topic. Finally, they ask a partner for his or her opinions. 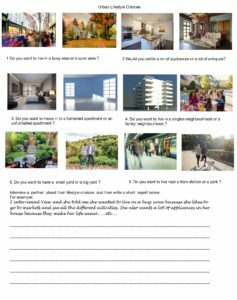 This is an ESL speaking and writing lesson for talking about lifestyle choices.. First, students interview a partner using the questions below the pictures. Then, they write a short report about their partner’s lifestyle choices. Students look at the pictures or use their own ideas to list the advantages and disadvantages of living in the city.